Nostalgia: Paris 2 | What's (in) the Picture? Paris is a nostalgic place for many people for many reasons. I browsed my archive for pictures to publish in – an originally – small series. That series caught on a bit more than I thought.All of them are not retouched yet.Scratches, dust and stains are not removed. Shot with Nikon F90 on Kodak TriX, scanned from film and edited using Snapseed and Marksta . Click the picture for a bigger version. The ‘Place de Clichy’ and ‘La Trinite’ signs would give a clue to the location to anyone who hasn’t been there! It is the corner of Boulevard Hausmann and Rue de la Chaussee d’Antin. 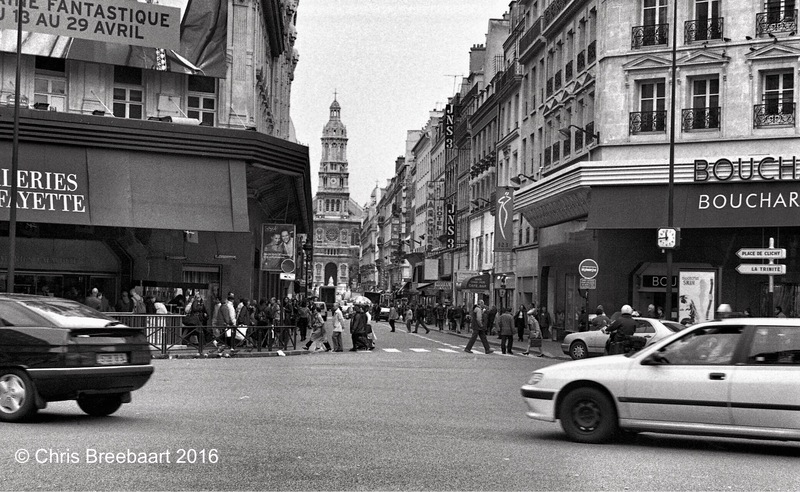 On the left is Galeries Lafayette and we look into the Rue de la Chaussee d’Antin towards L’église de la Trinité. B and W definitely adds a nostalgic feel to this shot. And thanks for the ping!